M&S Parking: Attention truckers- NYC needs your input! Attention truckers- NYC needs your input! The NYC Department of Transportation is gathering information from truckers on what kind of GPS they use in an effort to provide more accurate routing data. According to Land Line Magazine, The City is attempting to decrease the high number of trucks that strike low bridges after their drivers are rerouted by their GPS units. New York has been working on the issue of consumer GPS directions causing bridge strikes for the past few years. 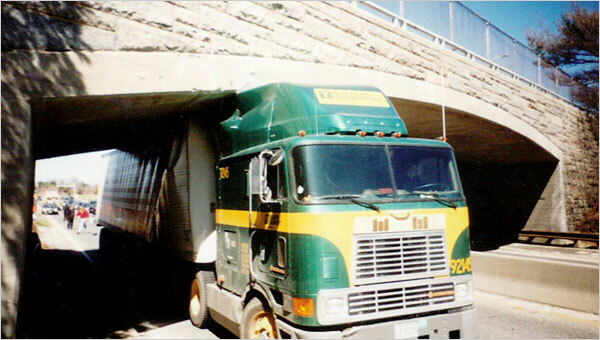 In 2011, the state DOT issued recommendations that truckers be prohibited from using consumer GPS to plan their routes, as studies showed they often provided directions onto restricted roadways with low bridges. Last year, Sen. Charles Schumer, D-NY, filed a bill to establish standards for commercial GPS units to help further cut down on bridge strikes. According a recent CUNY study, approximately 200 bridges are struck by trucks every year, with about 44% of the strikes occurring on 32 of NY's 20,000 bridges. To contact the DOT with your GPS info, send an email to socialmedia@dot.nyc.gov or respond via twitter @NYC_DOT. I am a NY driver of Commercial type vehicles, mostly over 12 feet high. I learned long ago that most, if not all bridges in NY are under hieght rated by 12 to 18 inches and more which means that they are higher than the low clearance sign indicates. further bridge heights are usually measured at the lowest point, usually at the curb line (arched bridges). flat line bridges can have the same discrepancy. NY bridges should all be re-labled to reflect the actual bridge height like so many other states already do. Even commercial GPS units can have errors in their information data base because of the above. I currently use the newest Garmin Dezl 760 GPS and have found it to be the most accurate to date but still has limitations on truck information. it is large (7 inches) and extremely fast on rerouting, and I reccomend it highly.